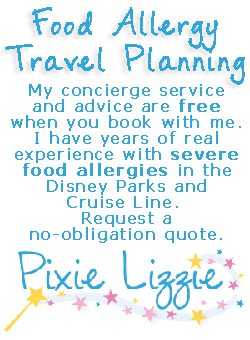 On our last 2015 Summer Disney trip, we finally went to Disneyland with our daughter, who has food allergies. We visited the Happiest Place on Earth and fell in love! Like every thing, Disneyland has its good points and so-so points, but nothing bad! For us, the only negative is that we can’t drive there like we can Disney World. We ate three meals a day and tried to walk if off… I’m still dieting to lose the extra pounds! 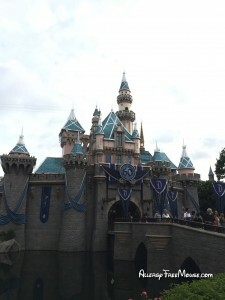 Disneyland is different than Walt Disney World in the food allergy world. You wouldn’t know the difference unless you visit Disney World often or know where to go see special over the top chefs such as Chef Frank at Hollywood & Vine, Chef Ron at Crystal Palace or Chef TJ at Trails End. However, Disneyland has some very talented chefs as well. 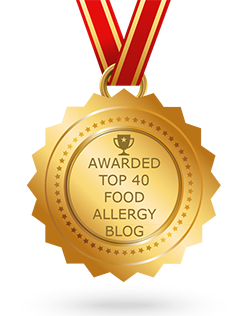 You won’t find allergy-free cupcakes, brownies, or ice cream, but you can order an allergy-free cake and have it delivered to your resort room or a restaurant. We did this and we were so glad we did. We took it back to the resort, the Grand Californian, and our daughter ate it all week. As for the Disneyland park… we loved it! As for the California Adventures park… we loved it! It’s like a boutique Disney World. You can walk everywhere! 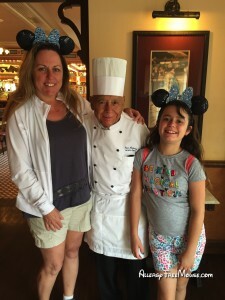 The chefs were wonderful and we have to say our very best meals were at Plaza Inn for breakfast, Carthay Circle for lunch, Steakhouse 55 for dinner, and Flo’s V8 Cafe for quick service. You have to see Cars Land at night! We will be adding reviews of each of the restaurants we visited, soon! Oh… we met Chef Oscar Martinez. He has worked at Disneyland since it opened in 1955! He welcomed us with a hug and shared fond memories of the beginnings of Disneyland. Flash forward to last week, when we asked Chef Randy at Sanaa to sign an apron, he saw Chef Oscar’s name on the apron and said “Oh, I have heard of him… he’s the longest working chef at Disney.” Chef Oscar would have been so thrilled that this incredibly skilled chef at Sanaa knew about him! 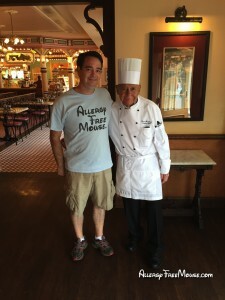 Chef Oscar shared with us that the window above the Carnation Cafe, where he has worked for years, will have his name added, when he retires… which will probably be quite a while!